LE BOURGET, France -- Declaring himself an "island boy," President Obama met with Pacific and Caribbean leaders today and announced $30 million toward a risk insurance program aimed at shielding vulnerable countries from climate change-related disasters. Departing Paris after two days of shoring up support for a new global climate agreement, Obama said France's decision to host nearly 200 countries just two weeks after deadly terrorist attacks showed a "remarkable display of resolve." He hit back against those who criticized spending time on climate change at a time when national security threats loom large. "Great nations can handle both," he said. Just what two days of furious climate diplomacy at the highest levels has accomplished remains to be seen. Over the past 24 hours, Obama has also presided over the creation of a 20-country, $20 billion expansion of clean energy research and development with Microsoft co-founder Bill Gates and promised $51.2 million toward a $248 million fund for the world's poorest countries. Now that Obama and the nearly 150 presidents and prime ministers who arrived to kick off U.N. talks are headed out of town, the real work begins. Lower-level negotiators will be poring over texts, fighting over semicolons and legalese in an effort to hammer out a new agreement. "The rhetoric is set. The question now is whether the negotiators and ministers can deliver," said Liz Gallagher of London-based climate think tank E3G. The support of island nations -- often called the moral voice of the climate talks -- will be key in getting any deal. Over the past several months, island leaders said, the United States has been courting them heavily. Meeting with the presidents of Kiribati, the Marshall Islands, Barbados, Papua New Guinea and St. Lucia, Obama highlighted his own childhood years in Hawaii and Indonesia. "I'm an island boy," he told them. Low-lying islands, he said, "are not the most populous nations; they don't have big armies. But they do have a right to dignity and a sense of place." He hailed the risk insurance initiative, first announced at a Group of Seven meeting in May, as a way to help vulnerable countries build resilience to climate risks. Island leaders praised the effort but said it is still not enough. "We are still negotiating. We haven't come to any agreement yet. It's the game of negotiating, but for us it is not a game. 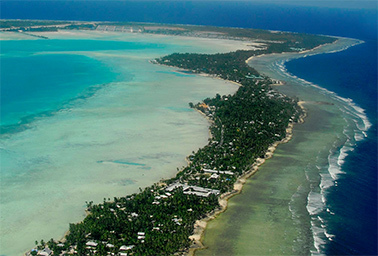 It's a matter of survival," Kiribati President Anote Tong said. Specifically, vulnerable countries want to see two things. The first is language stating that the objective of any agreement is to keep the global rise in temperatures below 1.5 degrees Celsius over preindustrial levels. That's just half a degree lower than the current 2-degree standard, but islanders say it makes the difference between life and death in their resource-dependent countries. More than 100 countries are pushing for 1.5 degrees, but the United States, China and India oppose it. "We really need to make it very, very clear that the target of 2 degrees refers to saving economies," said Tuvalu Prime Minister Enele Sosene Sopoaga. Keeping the temperature rise to 1.5 degrees or below, he said, "is about saving our people." Meeting with Pacific and Caribbean leaders today, President Obama announced $30 million toward a risk insurance program aimed at shielding vulnerable island nations such as Kiribati from climate change-related disasters. Photo courtesy of Wikipedia. The second is a provision in the main body of a Paris agreement that creates a permanent way for dealing with the losses nations are currently facing from climate change. Even if all nations were to shutter factories and pull cars off the roads tomorrow, scientists say countries would still face crop losses, droughts, storms and cyclones -- and in the Pacific especially, they already are. The United States has fought hard against such a program for "loss and damage," as it is known, because it fears it will imply governments or businesses will be liable for compensation. That, U.S. officials say, is a "red line" they will not cross. Sopoaga said he spoke directly with U.S. Secretary of State John Kerry about the issue recently, and is hopeful of coming to an agreement. "John Kerry rang me the other day when I was in Malta seeking our understanding again on loss and damage. I said, 'Look, John, you understand very well the catastrophic consequences we face. This is all what we are seeking, some assurance that we will be properly protected,'" Sopoaga said. He argued that island nations are "fully sensitive" to the United States' concerns about opening itself up to liability, and said island nations have bounced around possible compromise language. "I hope during the next few days we can work with the American negotiators," Sopoaga said. Obama, for his part, left Paris upbeat about the prospects for a global deal. "I am convinced that we are going to get big things done here," he said.